It is hypothesized that the use of cognitive system concepts as well as multiple input, multiple output techniques can enable accurate and robust indoor localization using a passive radio frequency identification (RFID) system. The propagation channel between a fixed anchor and a passive RFID tag is characterized by a degenerate pinhole channel, formed by the concatenation of the channel from the transmitter to the tag and from the tag to the receiver. 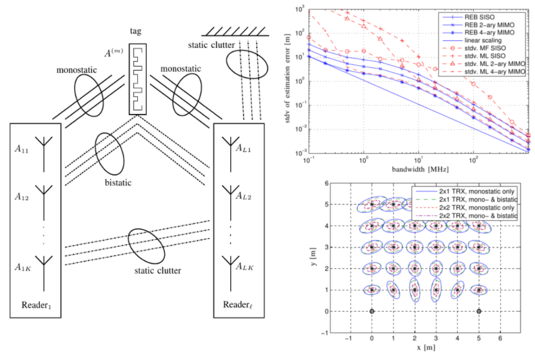 Previous work at the SPSC laboratory has shown that the deterministic components of both, the line-of-sight and the non-line-of-sight, stemming from multipath propagation can increase the position accuracy of indoor positioning. This is especially true if the bandwidth of the transmitting pulse gets larger, leading to better time resolution. State of the art ultrahigh-frequency (UHF) RFID tags can be described as narrowband, meaning that the bandwidth of the pulse does not exceed the channel's coherence bandwidth. Currently, efforts are put forth to increase the bandwidth used for UHF-RFID tags to employ wideband (in some cases ultra-wideband) signaling. By learning radio-channel parameters online, an adaptation of the signaling scheme can be employed to ensure robust localization and efficient resource allocation. Cognitive radar is a concept to cope with the aspects of learning the environment and adapting the system parameters in a combined fashion.